I have to admit, though. 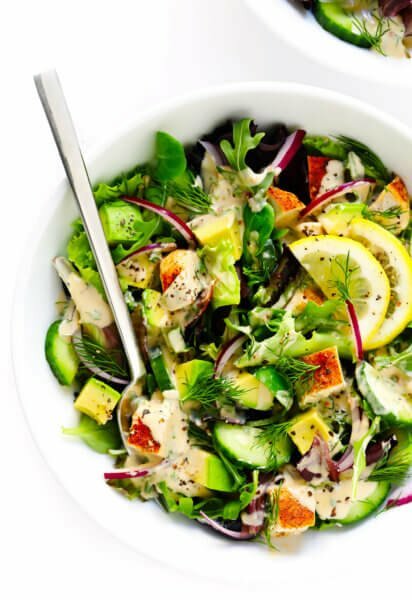 As much as I adore loading up leafy green salads with all sorts of fruit and veggies and nuts and protein and cheeses galore, I think I will forever and always be a Caesar salad girl at heart. Which, on one hand makes me extremely happy (because let’s be real, caesar dressing is king), and on one hand makes me highly annoyed (because why do I always crave the least-healthy salad on the menu?!?). It’s true — Caesar salads are consistently some of the worst salads you can order out at a restaurant in terms of fat and calorie content. Plus, their dressings are often stuffed with unnecessary processed ingredients. And of course, many people still get iffy about the idea of eating raw eggs in their dressing. 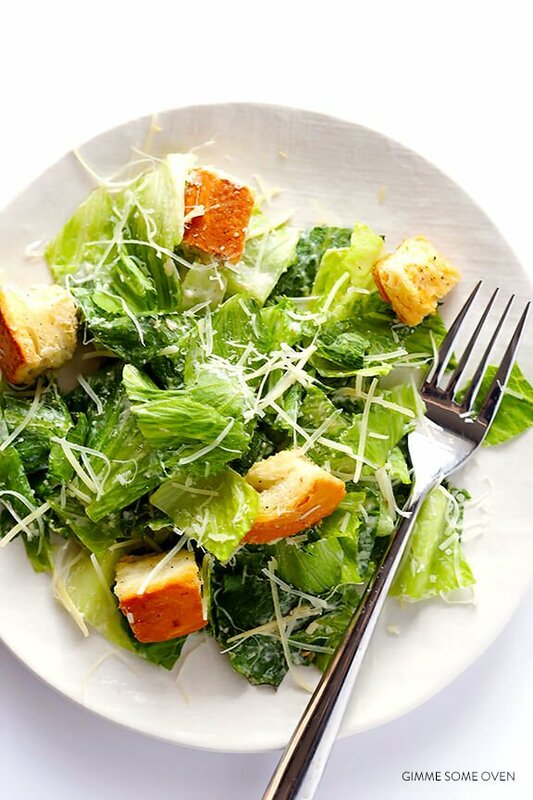 But here’s the secret that restaurants don’t tell you — Caesar salad is totally easy to lighten up at home! 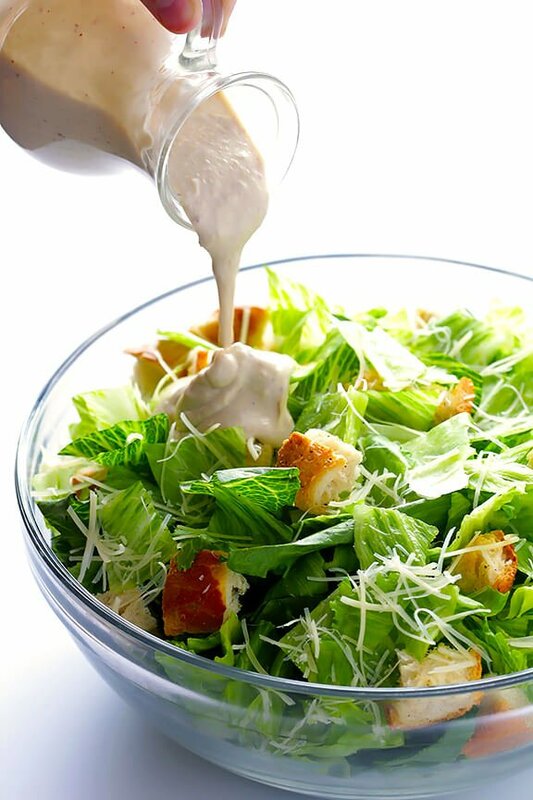 Still, the most important part of lightening up Caesar salad is the dressing. Traditional Caesar dressing is often packed with tons of olive oil, sometimes cream, a raw egg, and copious amounts of Parmesan cheese, amongst other things. Delicious, but definitely not nutritious. 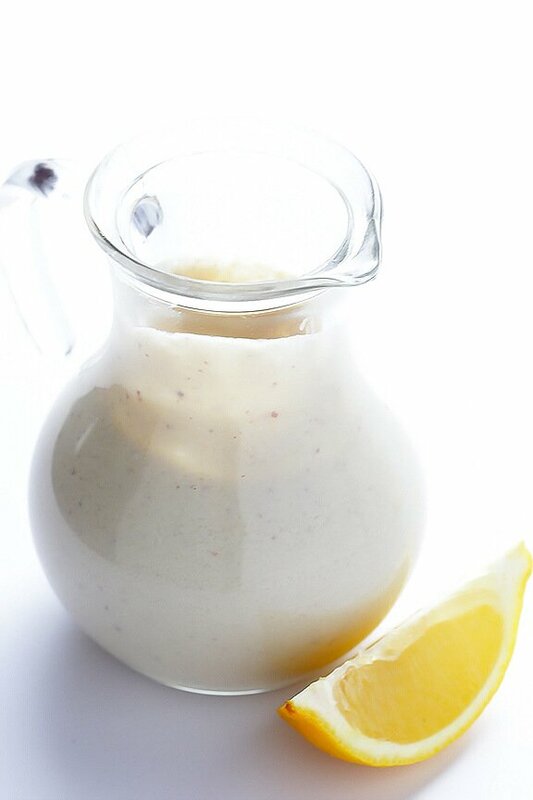 My favorite Greek Yogurt Caesar Dressing is lightened up with lots of creamy nonfat Greek yogurt (replacing most of the olive oil and cream), it’s raw-egg free (I never miss it), and we pair a moderate amount of Parmesan with the other flavor boosters in the recipe. You can find the recipe for the dressing here. The other key, if you’re lightening things up, is to go with homemade croutons. Because first off, homemade croutons are always 10x better than store-bought. But the other benefit is that you can choose your favorite kind of bread (whole wheat, gluten-free, whatever sounds good), and you can control the amount of oil (or butter) and seasonings you use to help crisp them up in the oven. I’m a big fan of just misting leftover bread chunks with olive oil (using a Misto), sprinkling them with some generous pinches of salt and pepper (and occasionally Italian seasonings and garlic powder), and then baking them up until crispy. 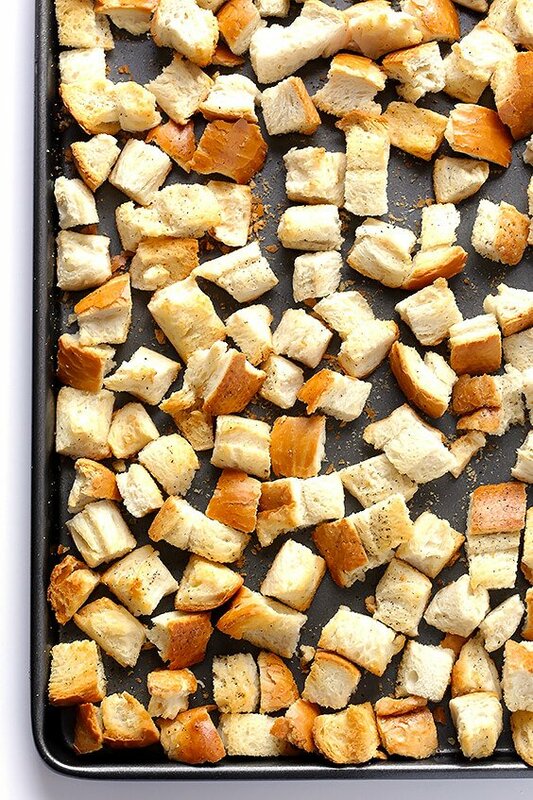 You can find a tutorial for making homemade croutons here. Then once you have those main ingredients all prepped, you’re ready to go with the salad. 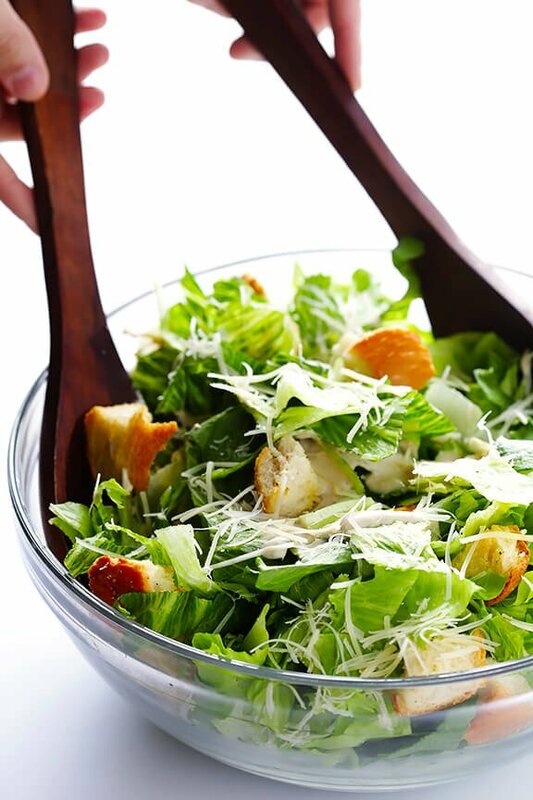 …and this healthier and crazy-delicious Caesar salad will be ready to go in no time. I went ahead and made this batch with the classic ingredients, which I tend to consider a side salad. But feel free to add in your favorite proteins and veggies to make it a main course. Because you can’t go wrong with Caesar. 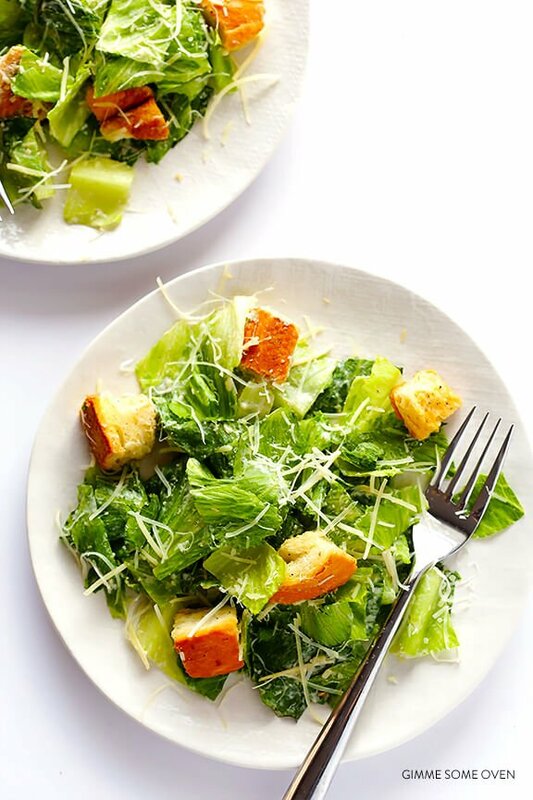 This lighter Caesar salad recipe is made with a Greek yogurt Caesar dressing, and comes together in just minutes! 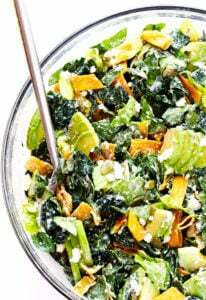 Toss the Romaine, croutons, Greek yogurt Caesar dressing and 1/4 cup Parmesan cheese together until combined. Serve immediately, topped with extra Parmesan cheese. *Parmesan cheese is much more flavorful when it is freshly grated. So in order to use less cheese, be sure to grate it just before serving! I LOVE me a good green salad with ALL sorts of fixins too, but sometimes you just want a simple Caesar Salad. I am LOVING that you used Greek yogurt in the dressing…hello protein boost-age! Pinned! I love this dare Ali. I am also a big Caesar salad lover, and also conflicted about it. I always feel so guilty ordering one, though not because of the health reasons (I should be though) but because I feel like it is so predictable. It doesn’t stop me, and I get them all the time, ha ha. So glad you lightened it up, love the croutons and the Greek yogurt twist! Pinning! I’m always in the mood for Caesar salad! I actually love making them with kale, too, which adds even more nutrition! 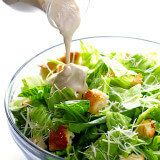 I’m really interested to try this lighter Caesar salad – especially the dressing. This could be a complete game-changer for me! I agree, Caesar salad is one of my “go-to” salads at restaurants, but it’s always so heavy and so filling I can hardly take a bite of my dinner (yet, somehow I always have room for dessert. Weird how that happens…). But my guy LOVES Caesar salad so I’m super excited to present him (and myself) with a healthier alternative. Great recipe! I feel the exact same way when I order a Caesar…why is it when I crave salad, I crave the biggest calorie bomb out there?? This looks like the perfect solution! I love homemade Caesar salad and can’t wait to try this dressing! Pinned! I am such a Caesar salad lover, but hate all of the calories and fat that usually come along with Caesar dressing. Plus I prefer homemade dressings to the store bought versions. I’ll definitely be giving this lighter version a go! I go through phases where all I want is salad…caesar salad. Then, I forget about it for a few months and explore my other options. 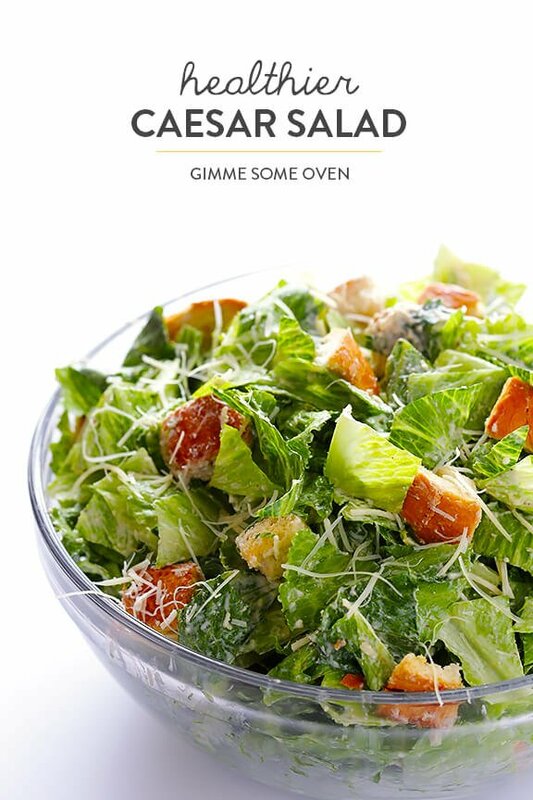 Thank goodness I just stumbled across this recipe since it’s time that my craving for caesar salad to begin again. :) Looking forward to making this. Caesar is my favorite too. I think of it as an indulgence since I know it is not the best option. But with this new dressing bring on the salad bowls. I just love salads! 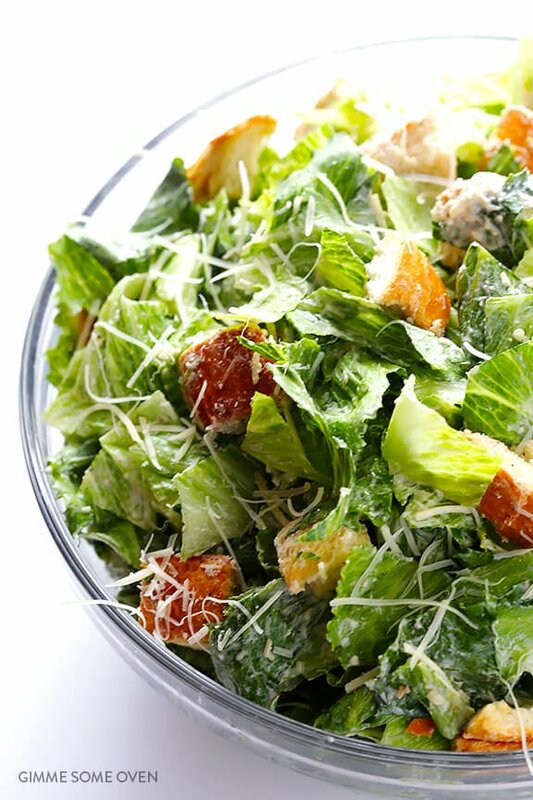 Your caesar salad, dressing and croutons look amazing!!! I have always been such a fan of Caesar Salads too! Just something about that dressing and that crunchy romaine gets me every time! I can’t wait to try this lighter version! It looks delish! I love a good Ceasars salad and your looks absolutely delicious! Just made this dressing and LOVED it. Tastes just as good as the store-bought version (if not better and more fresh), but sooo much healthier. 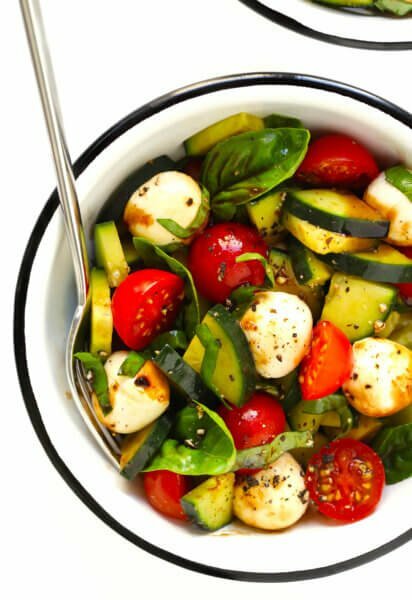 I’ll be adding this to my homemade salad rotation! Thanks Rachel, I’m glad to hear it! I’m just loving your beautiful salad! I’d like to include it in my Healthy Weeknight Meal Plan post that I publish each Friday. All credit and links back to you, of course. I so enjoy your gorgeous blog! Ooops…just wanted to mention that the link to the salad dressing seems to have disappeared! I’m not much of a cook, I try to eat healthy when I can but I don’t sacrifice taste to do so… Guilty. I got on this yogurt kick and thought I’m gonna try to make my own dressing! I tried some other recipes online and they were “meh”. I did this one and it was nearly perfection. I wanted to add a bit of thickness and rich flavor so I added 1 tbsp mayo to the recipe. Few more calories but a lot less than store bought and it is to die for! Especially if making it and letting it sit overnight. It won’t keep long in the fridge (3-5 days) but I haven’t had a problem as I’ve been eating this with every meal and all but lick it off my bowl ?! Thank you so much for this recipe! !